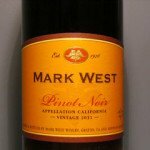 From Sonoma County, California, Mark West Pinot Noir is one of the most well known Pinot Noir wines out there. 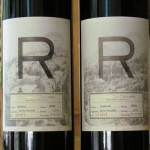 For this review, help was enlisted again from the two people who provided a recent guest review for the Charles Krug 2009 Cabernet. There were multiple opinions on the Mark West Pinot Noir and after tasting, we paired this wine with a very unique pizza. More on that below. In the glass this wine was a little light colored. Similar to a light garnet. However, in the glass the wine presented thick legs. The nose of the Mark West Pinot Noir gave forth aromas of young plum, vanilla, raw raspberry and a little bit of black cherry. Very little alcohol aroma was observed. 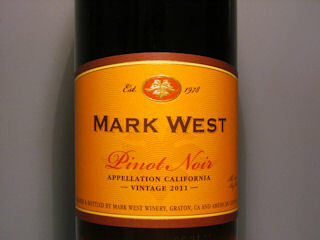 Mark West Pinot Noir alcohol content 13.8% by volume per the bottle label. According to the bottle, we were to be prepared to notice flavors of red and black berry. Also some spice. Our actual observations were of young berries, mild cherry and a little bit of smokiness. For texture or mouthfeel, we all felt it was a smooth drinking wine. The three textural comparisons were satin, cotton and pima cotton. More smooth than rich. Tannins were balanced and mostly noticed on the sides of the tongue. Finish of the Mark West Pinot Noir was short to medium and pleasant. Overall, we felt this was a good wine that won’t overshadow what you’re eating. Two out three felt it was a reasonable value. Mark West Pinot Noir price paid for this bottle was $9.99. After the more formal tasting, we paired this wine with a very flavorful pizza. It was topped with venison, goat cheese, Kalamata olives, marinated artichokes, tomatoes and caramelized onions. We felt a followup was needed on how the wine changed with this dish. What we found was that more of the wine’s acid was able to come forth. We felt this was due to the olive oil in the pizza and how it affected the overall structure of the wine’s flavor. The wine’s texture changed. It became a little more rough and personally, I found this to be enjoyable. So there you have it. Mark West Pinot Noir on it’s own and also with a creative food combination. Give it a try! As you can see from the comments below, this wine is not receiving favorable feedback. When I had this wine I thought it was OK and better with food. However, based on the recent feedback and the fact that one of the above tasters didn’t feel it was a good value, I’ve rescinded the suggestion to “give it a try”. I’m so pleased that people chose to provide comments and feedback below on this wine. This is what Honest Wine Reviews is all about… being honest and helping out the wine consumer community. Thanks!! I tasted the Mark West Pinot 2011 today, it was not an acceptable taste. This is the first bottle of California wine that I have poured out after half a glass. The feel was like cool aid and there was a slightly racid taste that remained as after taste. It was disturbing. 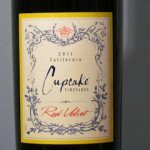 I buy California wine every week in the range of $10 – $25. I have never been disappointed until today. Wow! That does sound disturbing. I wonder if you got a bad bottle? Either way, not a good experience for you. Thanks for sharing your honest opinion and hope your next bottle of wine is much better! Though I wouldn’t go so far as Michael, I just opened my first bottle of this wine and it tasted more like a 2 euro table wine rather than anything with character. I suppose the difference is that I don’t throw out table wine? Thanks for the comment Ian, appreciate the honest review. Definitely seeing mixed reviews on this wine. I was just gifted with a bottle of this. Normally, I prefer a cab. This does have a bit of a bitter aftertaste. I would not buy it. Thanks Deirdre… Looks like you’re in good company. Not many people are feeling the love for this wine. Thanks for the comment. Go Sox! Hi Paul – Thanks for commenting! You know, this wine is not getting a lot of good feedback. I’d be hard pressed to tell you to hold on to it. Especially if you’re not a Pinot fan. In my opinion a good wine starts out good and gets better with age. If it’s not starting out good, I wouldn’t hold on to it for very long. 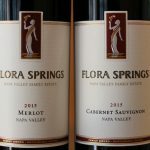 I love Pinots and have bought Mark West at restaurants many times for the value. I generally buy better wines for home. I recently bought a bottle for home, and I must say that I am officially over this wine. The flavor is weak, and the finish is coarse. Some wines are not worth even $10, and this is one. Never again. I think that it is smooth and pleasant. It goes well with food or is pleasing as an after dinner wine. This is after eight or nine bottles. Just took a bottle of the MW 2011 Pinot Noir back to the store as the cork fell into the bottle when the Rabbit slightly pushed on it, and it had a very acidic finish that lingered unpleasantly. Got another bottle and the cork was fine this time, but same biting finish. Not even cheesey pasta helped. I think I had this vintage a couple times in the past year and remember thinking that it was a good deal for $10. Can an entire vintage turn bad that quick? 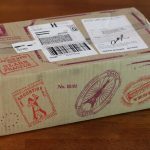 A bad box of wine? I bought 2 bottles of Mark West Pinot Nior tonight. I had a glass before home made mac n cheese with and after. It had very poor quality, almost undrinkable, with or without food. Then I googled it and found your reviews. Your comments are similar to my thoughts on this product. Thanks for the comment, David. Home made mac n cheese sounds awesome! I believe it was turned as it had a very bitter flavor that was noticeable upon first swallow. We have also had two bottles turned upon opening at our local country club where I work. Despite that, many of our members still order and enjoy this Pinot, I myself would order it again provided they offer a solution to this problem. Thanks Amber! You may be on to something regarding a bad batch. There’s so many variables, though. I have to say I agree with this comment the most, I started drinking MW in 2008 and loved it at $23 a bottle (NYC), I was glad to see the prices drop but since then it’s incredibly inconsistent. Not sure if it come from a bad season or bad batches but it’s true. Embarrassing when you serve a bad bottle at a party. I was about to move on, but recently tried 2 bottles of the MW Black and loved it. Any recommendations for a solid Pinot at a low price point? All I can say is YUCK ! I would not buy this wine ever again! I bought the Mark West Pinot Noir on reputation. Heard some good things about it but I can’t remember where. Fortunately, I have moved recently so I shouldn’t be near that place. It is light up front and over oaked making it harsh in the back. Not even a good table wine. At first I wondered what I was missing but from the comments above I didn’t miss much. Horrible. I really enjoy Pinot noir. For a while now it has been my wine of choice. I do not mind switching between brands in order to keep my palate curious. I had mark west for the first time at a local restaurant that serves Italian food. They list this wine as a step up from their house wine thereby charging more. Frankly it is too hard on the front end with a too powerful and unpleasant after taste. Will not buy again. Sorry but the worst experience so far from all of my California wines; let alone Sonoma County. Had a box as a gift; but may have to put aside for years just to try to see how aging impacts it. Thought of re-gifting; but “if I hate it, who among my wine enthusiaasts folks will…?”. All these; just after the 3rd bottle was opened. Light bodied aside, the horrible bitter flat after tastes need be looked into for improvement by its crafters. Worst of all, I felt sick with acute bodily pains after 2 glass full in all of the 3 instances. It would be difficult for me to recommend a buy on this one. Period! Oh my! I had planned on opening a bottle my daughter gave me, with some lamb chops I was preparing. However after these reviews, I will let it sit in the rack. I will open it one day, when I feel brave. I purchased a bottle of 2012, I am a huge Pinot fan and have even been known to say “I’ve never had a bad one”. I would put this bottle in the $5 category and would not purchase it again. The fullness was not there and had a harsh taste to it. The bottle says “aged for 8 months” IMHO it needed 8 more! Interesting commentary. Totally disagree, but to each their own. This has been our go-to inexpensive pinot for years. Some better than others, in fact we skip some years. Just cracked a 2011 bottle open last night with friends and all found it to be flavorful and smooth. Just came back from the store with six more. On sale at publix in the Tampa area for 7.49! We drink in all price ranges and yes, that 50 case handcrafted pinot we have is way better but also $50 a bottle. This pinot is perfect for midweek dining where you want wine with dinner but nothing complex and expensive. 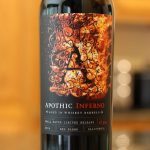 Been our house wine for a good 5 years (even when it was 12.99 per bottle at most stores) as the flavor is good and price point is excellent especially recently with a case @ Big Y costing just $66 after rebate! There’s usually at least a little difference from year to year for many wines. Each season brings different weather and growing conditions with any varietal. And there could be differences in the wine making process from one year to the next. I’d give less weight to the glass color and maybe just a bit more to the alcohol content. Still… very hard to tell. Keen observations though, and that’s helpful to everyone. Thanks for commenting, Phyllis! Mark West Pinot Noir 2012 sells for $17.99 in BC, Canada. Very poor value even when compared with local wines and worth paying extra for one from Oregon. Thanks for the comment, Tim… I’m with you on the Oregon Pinots! LOVE this one. One of my favorites. Love having a glass and relaxing by the fire. Thanks for the comment, Kathy! That does sound good. If you want to bring this wine to a pallitable flavor add 1tsp. Of sugar. It saves the wine if you don’t want to pour $10 down your kitchen sink.. Thanks for the comment Bob… Your opinion is appreciated! I have tried several of the different Mark West Pinots and have to say that I haven’t had a bad one. The ones from Carneros and St Lucia Highlands could go up against $30+. I just opens a bottle of the 2014 Mark West Dark. A bit heavier than the standard but is settling in nicely. Thanks for commenting Chas! A great holiday to you as well. Was at the local go to liquor store. and was making small talk with the stocking clerk. ( he was pretty knowledgeable) The subject of Pinots came up and I had just had a Mark West black label with a group of friends and it had been Very popular. I loved it. and thought the $15-$16 was a pretty good value. He commented the yellow label Mark West pinot that was selling for $10 or so was probably the most popular pinot they sell. go figure. 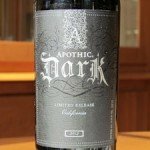 I have had some great Mark West wines, and one of our local stores had the 2014 Pinot as one of their May specials. I had hopes of buying a few (5) and putting them away. This is NOT giving me any kind of warm and fuzzies about this, as I just bought them this afternoon. I will try one this evening and see what happens. Hi Shelley, thanks for commenting! You never know, sometimes you get a good surprise. If you get a chance to come back with your opinion after tasting it, I know I’d love to hear it. I live in Oregon where some of the best Pinot Noirs come from. Given where you live, I think I’d stick with the great local Pinot Noirs over MW. Been reading reviews on Mark West Pinot Black and I have to wonder abut trying them Our local Publix has them on sale 10.00 buy one get one free lowering it to 5.00 Guess I will have to try it. Now drink Borsao Granacha for around 7.00 and really enjoy it and think the price reasonable. I’ve been hearing more and more about Mark West Black, though I haven’t tried it yet. I do like Granacha and agree with your thoughts about the price. We like the mark west black label but since it has been on sale at Publix, have been unable to find it anywhere now. Hi Peggy, thanks for commenting… I’m not sure if Publix still carries it or not (I’m not from the area where those stores are), but I do know from checking out my local Total Wine that it is still being produced. Mark West made decent, value for the money pinots, but not in this century. The regular pinot is about as rock-bottom swill as one can get in California. I hope that the Black is better, but it has to be, since the regular is the pits. They say that it is “hand-crafted”: well, it must be, because no machine would make something so bad. I just opened a bottle of 2014 Pino Noir, which I bought from BJ’s. It was discounted from $19.+ to $12.+. Very disappointing. Not worth the $12 and most certainly not worth anywhere near the “original price” of over $19. I just had a 2014 vintage, California Pinot Noir. We decanted and enjoyed. It was just fine! Note that Mark West has 6 varieties of Pinot Noir! Of those, this “Appelation California” is the only one without a specific area specified. Perhaps that leads to more batch-to-batch variation than the others(?) The other varieties are Monterey County, Santa Lucia Highlands (a specific part of Monterey county), Caneros, Russian River Valley, and Willamette Valley. I have no doubt that Mark West truly cares about making good wine and will be trying the other varieties. This is the worst “plonk” I have had in many moons!! The cork was brittle and I had a hard time removing it ended up pushing the cork in and straining the wine. My first sip thought: this is not good wine. Tastes too tangy and acidic. Not velvety or smooth at all. It’s sharp. Which is ok… Just be prepared. Maybe a Pro? It tastes strong and is giving me a buzz pretty fast… definitely pair with food! Thanks for taking the time to write up your thoughts… Much appreciated! I am amazed at the number of comments from so many of you. While I agree with some of you, I wanted to make sure we compare apples and apples. While I am not a big fan of Mark West, I think for the price it might be ok. Someone bought a bottle of Mark West for $7/— you can’t really go wrong with Mark West at that price. I wonder whether we make fair comments on a bottle of mine without paying attention to the price. Thanks for sharing your opinions Deepay, it’s appreciated. I enjoy the 2016 vintage. It is fruity, but still dry. I like that it does not have the aroma of decaying vegetation (evidence that they removed the stems). I will buy again. this wine made my tongue tingle, sick to my stomache, hives on my whole body, and a trip to the ER! I believe these reviews! I have no food allergies! This wine wasn’t only bitter and bad tasting—it’s literally the first red wine that’s ever given me a SCREAMING headache within 15 minutes. I thought it was a coincidence and had another glass the next night—same reaction. I regularly drink pinot and have never had the problem. Bottom line, though, is it’s a lousy tasting wine. Thanks for commenting KP. Every opinion counts and sorry to hear you had such a bad reaction. Makes me wonder about the sulfite content in this wine. Awesome Pinot Noir with hints of blackberry, tobacco, and chocolate. Reading most of the other reviews here, it is obviously not liked by wine snobs. However, it is a great wine and great value for real people. It has my personal endorsement! Thanks for commenting and sharing your review… It’s appreciated!